So that's the regular league season over. A United View has been quiet for a while, it's been hard to know what to write and even harder finding the time to write it. Watching United in recent months has been one of the most frustrating things I have done in that time. Like teaching a child to ride a bike without stabilisers, you encourage, you urge them on and they briefly succeed, with apparent ease, before crashing back to earth with a bump. Then it's as if they've forgotten what to do. You know they're capable, but they can't put all the different aspects together. Failure, another failure, then they manage a good start before a major wobble and they land with a bump. The difference being that with a five year old you hide your frustrations. You keep consoling, keep smiling, keep encouraging. With your football team you vent. You rant in your seat, in the sanctity of the pub, on the radio, or on social media. To be frank, this league season has been disappointing. There is no masking it. Whilst for many clubs 5th place and play-offs would be an acceptable achievement, for a club with United's resources, larger than any other club in the division, it is not good enough. This isn't just arrogance or being dismissive of other clubs. It's about having seen what these players are capable of and not seeing them deliver it on a consistent basis. It's about seeing a team chopped and changed, yet consistently play without leadership, drive and urgency. For a manager tasked with promotion it is now left to the fine margins of 270 minutes of football, maybe with another 60 minutes on top or a penalty shootout or two. I could talk about squad size. I could write about comparisons with Bristol City. How the comments about the number of matches played don't fully stack up. I could question the number and extent of the club's injuries. I could pick apart the unbalanced squad and the manager's apparent inability to know his best eleven after 46 league games. But now is not the time. That post can come at the end of the month, hopefully with a theme of "in spite of all this....". Nobody wants Nigel Clough to fail. By inference that would mean United have failed. I did not agree with recent calls for him to go. Those writing on Jim Phipps' Facebook wall and tweeting him demand change but if pushed would've struggled to suggest who should replace him. 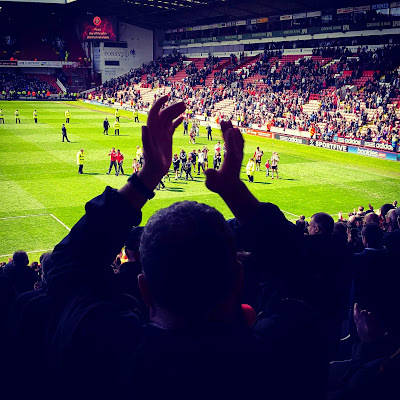 For me Clough has not failed until the season ends and promotion has not been achieved. Only when the final ball has been kicked, hopefully at Wembley can we say whether he has achieved his objective. I really hope he proves me and the other doubters wrong, I really do. Just because we doubt, doesn't mean we don't support, don't shout, don't sing, don't encourage. Nothing stops that, but the cold hard facts of this season say we were the 5th best club in League 1. We have scored fewer goals than any of the team's around us. On average we have conceded at least a goal a game. Our run of form going into the play offs has been dire. Previous play off heartache means nothing to this team, but it still burns hard into the collective memories of supporters. It can have no impact on the outcome, only in preparing fans' expectations. My concerns are only emanating from the recent past; the last 46 league games. To cling to hope means to think of the great cup performances over the last 18 months and how the team have raised themselves. Three back to back results are required. Accepted they don't need to be 3 wins, but the last time we achieved that was February. Thursday's team selection will be interesting as injured and rested players should return. Collins is once again available; the only fit centre back we have following his return from loan. The excellent ticket pricing should mean a decent crowd and a lot of noise; hopefully positive backing and a result to leave Swindon chasing the game at home. 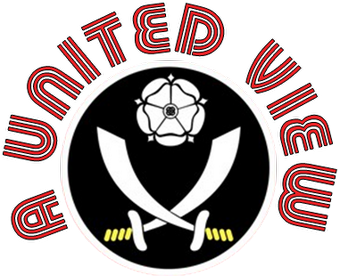 Let's hope we can truly be saying Up the Blades in 3 weeks time.